After removing loose or badly rotted wood, brush the Rotted Wood Restorer onto the damaged area and within 2 hours the damage can be filled with Bondo Wood Filler. The product is water resistant and is both paintable and stainable. A built-in brush applicator is attached to the lid for easy and convenient application. Because the product penetrates into the wood, it is able to create a solid base from within. Many products simply coat the exterior of the surface, but Bondo Rotted Wood Restorer penetrates beyond the surface. In only 2 hours, the product will dry to a tack-free finish that can be filled with Bondo Wood Filler to complete same day rot repairs. 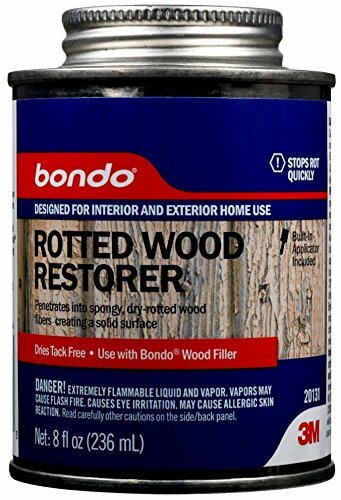 Bondo Rotted Wood Restorer is a one-part formula, meaning it does not require mixing. Simply brush onto the damaged surface and wait for it to dry to a solid surface. Wood rot is a common issue for most homeowner, regardless of where you live and can be easily repaired with the right products. If you have any questions about this product by Bondo, contact us by completing and submitting the form below. If you are looking for a specif part number, please include it with your message.